As the temperature decreases, CC and NC weak interactions rate drop down faster than H(T) and hence become not efficient enough in mantaining neutrinos at equilibrium. 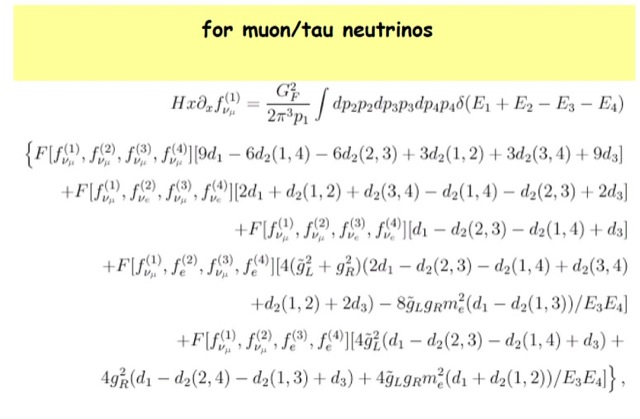 At this point one says that neutrinos decouple from the e.m. plasma (baryons, leptons, photon). 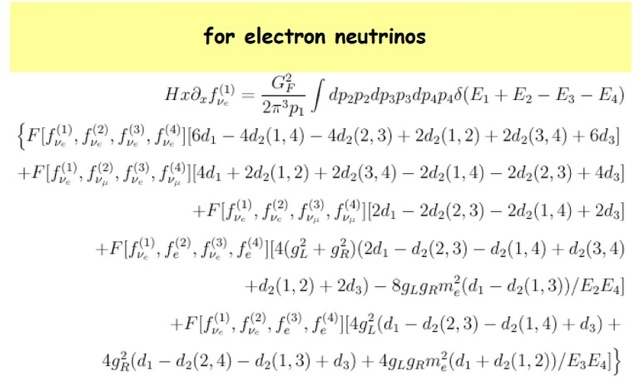 To describe neutrino decoupling in details, one should use the set of Boltzmann equations governing the evolution of their distribution function. Nevertheless in the following we will assume a simplified approach that provides quite precise results. 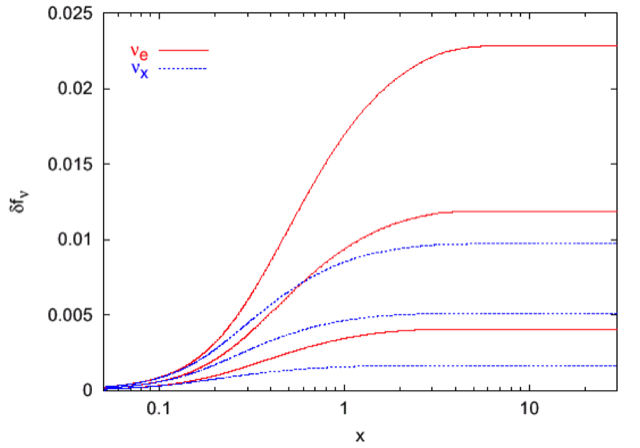 The temperature for which the weak interaction rate, dropping down because of the expansion, reaches the value of H is called the Decoupling Temperature, hereafter denoted by TνD. During RD epoch H ≈ x-2, in this case it is easy to find that the solutions are function of the combination y/x3, or y T3. In particular one gets a decoupling temperature momentum dependent, namely TνeD= 2.7 y-1/3 and Tν(μ,τ)D= 4.5 y-1/3. By using the average momentum, <y> ≈ 3, one gets TνeD= 1.87 MeV and Tν(μ,τ)D= 3.12 MeV. With instantaneous decoupling limit we denote the simplifying assumption of a neutrinos decoupling occurring instantaneously at TνD. In reality the decoupling takes place over an extended range of time. In particular more energetic neutrinos will be kept in equilibrium with e.m. plasma longer than low energy neutrinos. This means that even neutrinos to some extent get profit of the entropy release due to e± annihilations, and hence some thermal distortions will be imprinted in the neutrino distribution with respect to a standard Fermi-Dirac function. However these effects change the neutrino energy density at the percent level only, and thus will be neglected in the following. 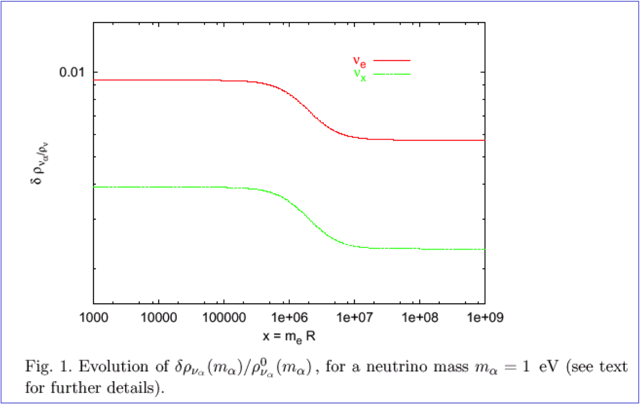 The neutrino to photon temperature ratio after neutrino decoupling can be easily obtained by using the conservation of entropy for the e.m. plasma. As long as electron/positron pairs are relativistic, the photon temperature simply scales as a-1 since the number of degrees of freedom gs is constant. When the temperature drops below a value ≈ me, e.m. , the process cannot be efficiently compensated by the inverse pair production. This implies that electron/positron distributions start to be suppressed by the term e-me/T, and practically e± disappear, apart from a tiny relic electron density related by electric neutrality to the baryon number parameter ηB. In practice, the entropy release due to e± annihilations reheat photons, whose temperature is then not decreasing as a-1 for a while. Due to the smallness of weak reactions at this temperature, neutrinos practically get no profit of such reheating, nevertheless even though to a very small extent, such phenomenon leaves a footprint on neutrino distribution functions. Using the known value of the CMB temperature today, T0= 2.725 K, neutrinos at present have a temperature Tν0= 1.945 K, or equivalently 1.7 10-4 eV in natural units. Since Ων ≤ ΩDM ≈ 0.2, we get for h ≈ 0.73, ∑i mνi ≤ 10 eV. we trust the instantaneous decoupling limit. and from the previous relation one gets ρint as well. The functions K’(ω) and J’(ω) stand for the first derivativeof K(ω) and J(ω) with respect to their argument. Note that neutrinos affect the final value of z through the terms ,which are not vanishing only if neutrinos have a non thermal behaviour. In case one neglects the finite temperature QED corrections, the functions G1(x/z) and G2(x/z) vanish, and one recovers a very well known expression reported in literature. Notice that the presence of G2(x/z) in the denominator of the r.h.s. of dz/dx makes, at least inprinciple, not correct to simply sum the neutrino contribution with the QED one. 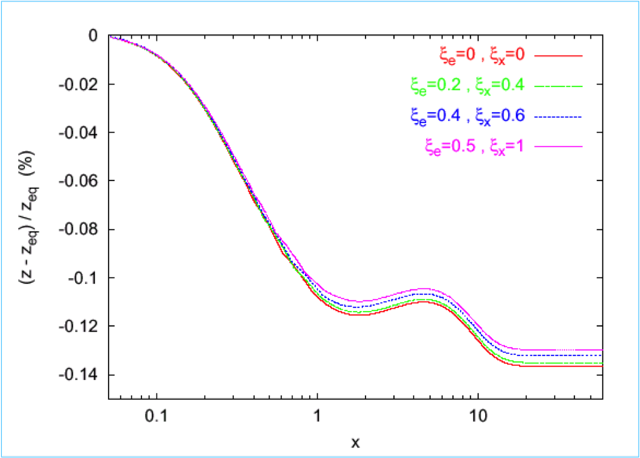 The asymptotic distribution functions are not perfectly thermodynamical distributions (out of equilibrium effects). where ργ is the energy density of photons, whose value today isknown from the measurement of the Cosmic Microwave Background (CMB) temperature. In the Table are reported the values assumed by the several factors when different effects are considered. and we have defined zX= TX a(t). The parameter gX depends on the spin (gX=1 for a real scalar, gX=7/4 for a Weyl spinor, etc.) as well as on the additional internal degrees of freedom of the X particles. 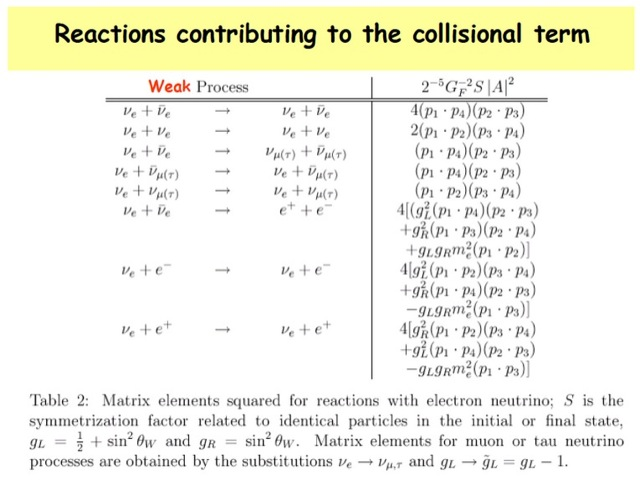 Notice that if the X excitations have decoupled between μ± and e± annihilation phases we simply have NX= 4/7 gX . For an earlier decoupling we have instead NX< 4/7 gX. 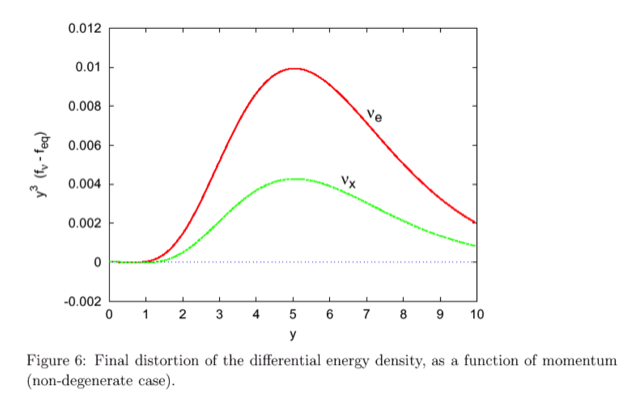 The presence of ρX, apart from introducing a new contribution to , slightly affects the results previously obtained, namely the relative change of neutrino energy density induced by incomplete neutrino decoupling, as well as the asymptotic photon temperature zfin. In fact since their energy density increases the expansion rate of the Universe, we expect to decrease with growing NX, and the ratio to become closer to unity, since neutrino decouplingprocess starts at earlier times.